then calls a civil engineer. * This graveyard erosion was already a worry in the 19th century, in the time of Dracula, no less, according to Bram Stoker's novel. Whitby is where that nosferatu landed in Blighty, and plenty of the narrative unfolds in the churchyard at Whitby. "Had to get the train from Potsdamer Platz. You never knew that. That I could do that. Just walking the dead. Sitting in the dschungel on Nürnberger Strasse, a man lost in time near KaDeWe. Just walking the dead. 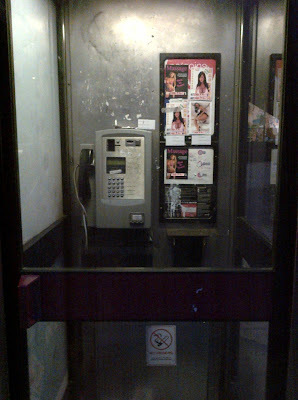 ..."
The phone booths beside the Willesden Green library centre with flyers and business cards left by pimps.